Take a gander at this huge poster from 1962 for Thunderball, starring Sean Connery as Agent 007 (in my book, Connery will always be the only 007, just as Shatner and Jeffrey Hunter will always be the only captains of any starship in the entire Star Trek franchise). The image in the upper right is definitely the work of paperback cover maestro Robert McGinnis. I'm not sure about the other three. 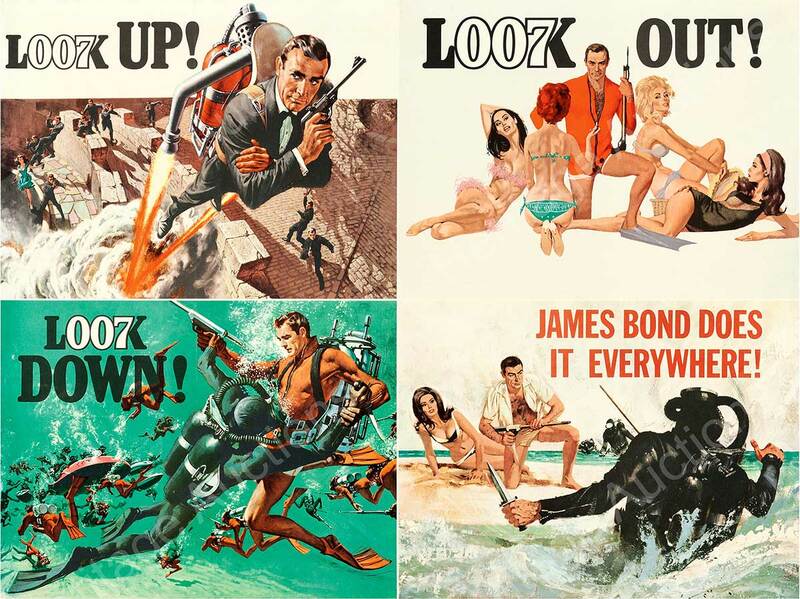 One of the rarest James Bond movie posters ever made – a gigantic, advance British quad for Thunderball – may sell for $10,000 among a large collection of Bond-related paper and screen-used movie props in Heritage Auctions’ April 7-8 Movie Poster Auction. The sale offers almost every Bond quad poster produced up until today, said Grey Smith, Director of Posters at Heritage. Each measuring 30 inches by 40 inches, quad posters are produced exclusively for British theaters and moviegoers. In creating the quad from Dr. No (United Artists, 1962) – the very first James Bond movie – artist Mitchell Hooks and designer David Chasman capture actor Sean Connery’s debonair spy in mid-wink against a bright yellow background (est. $6,000-12,000). A scarce, country-of-origin quad for From Russia with Love (United Artists, 1964) depicts what is arguably the best and most iconic image from the film thanks to artwork by Renato Fratini and Eric Pulford (est. $5,000-10,000). Featuring a gold-dipped Shirley Eaton superimposed over Bond (Sean Connery), the Style A quad for Goldfinger (United Artists, 1964) is perhaps one of the most desirable posters from the franchise’s 26 movies, Smith said (est. $5,000-10,000). Tibor Helényi created a lot of great posters for films screened in the Hungarian People’s Republic during its communist era, like these posters for the original Star Wars trilogy. Rotten Tomatoes compiled a highly subjective list of striking movie posters. Since the Moonlight and Sausage Party posters are well-known, here are a few lesser-known posters they list. Note: poster quality and film quality do not necessarily correlate.